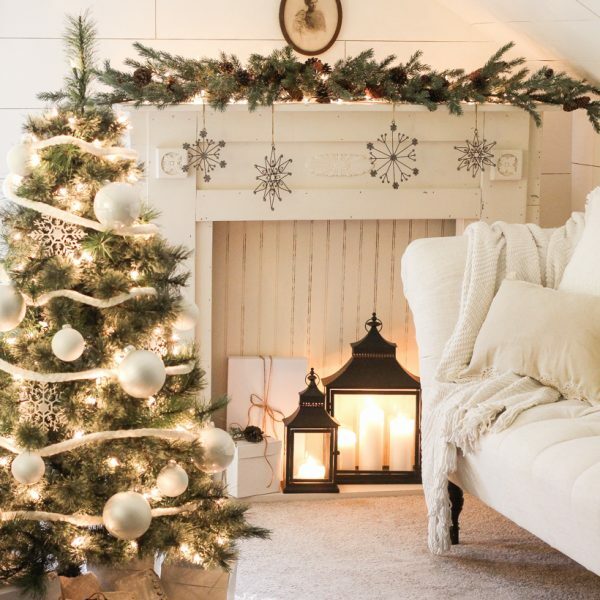 Ready or not, the holiday season is here! Can you believe it is already almost December? Craziness! So I’ve been trying to come up with a few fun, unique gift ideas to have on hand this Christmas for teachers, neighbors, hostess gifts, and that sort of thing. You can only hand out so many candles and gift cards before it starts to get boring! 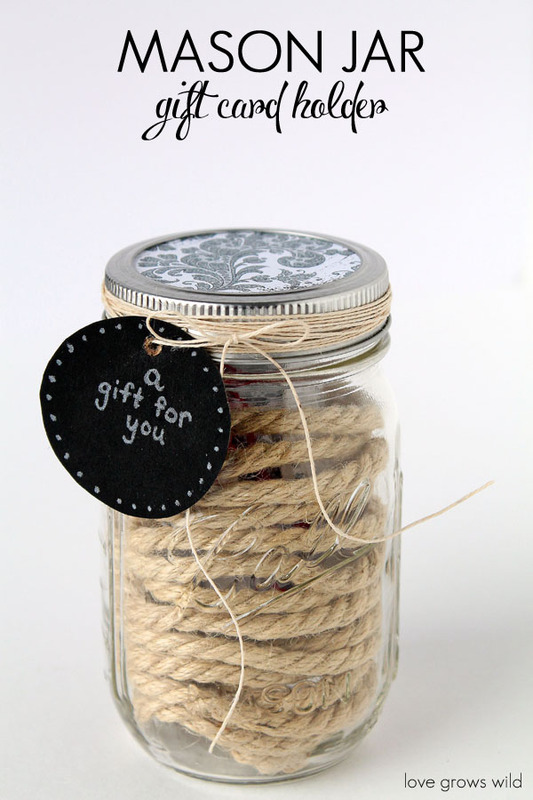 So I put together 5 special Gift in a Jar ideas that I think you’re going to love! I’m pretty much a mason jar hoarder, so I have ALL kinds of jars on hand. These 5 ideas just take a few minutes, a few dollars, and a bit of creativity, and you will have some beautiful handmade gifts to give to your friends and family! This is a gift EVERYONE will love! Who wouldn’t be happy with a big jar of chocolates to enjoy? 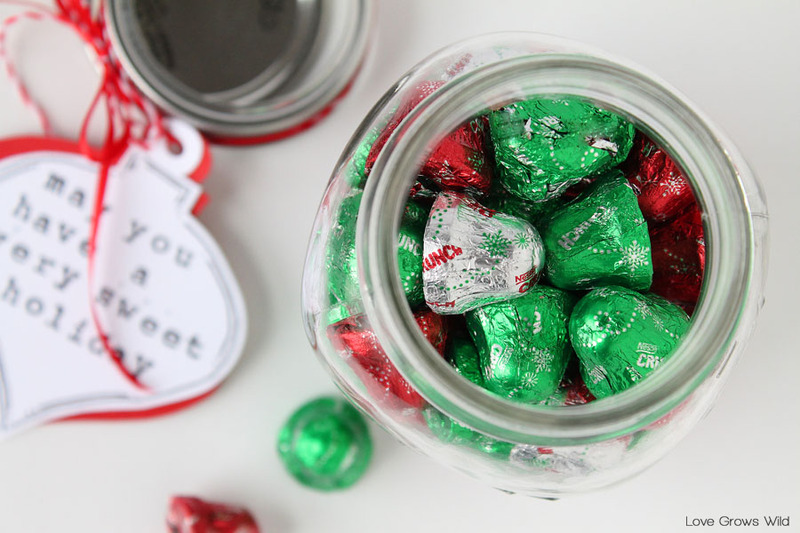 Pick up your favorite bag of candy, make a festive tag, and tie it around the mason jar lid with some pretty ribbon. Simple as that! I shared this pampering recipe for mint sugar scrub here the other day, and I just had to include it in this list! 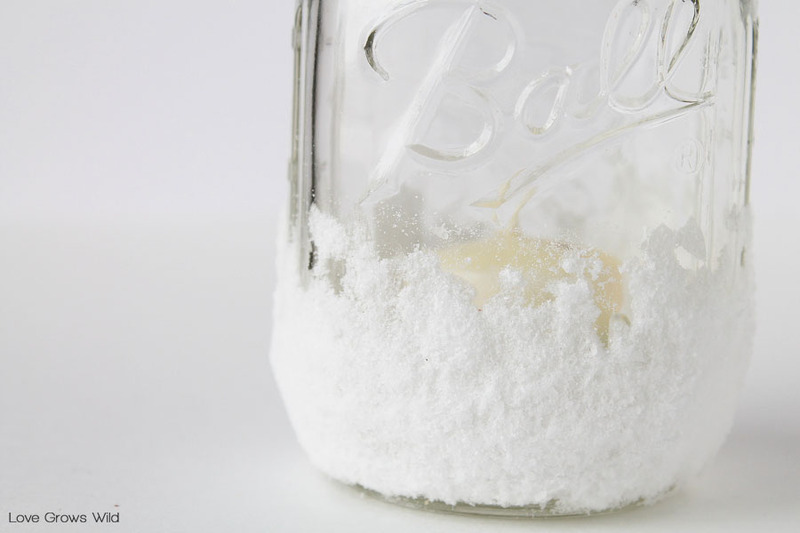 It’s really easy to whip up a batch, and it makes your skin feel super soft and smooth. And the minty smell is just intoxicating! To dress up the jar for gift giving, I added a paper doily on top of the lid and a stamped tag wrapped around the top with candy cane striped twine. So cute! What a perfect gift for any women on your list! This idea just might be my favorite! I love the layered cookie mixes in a jar, and I thought a homemade hot chocolate mix would be absolutely perfect for these cold winter months! This recipe is really simple, and the ingredients look just beautiful all layered in a big, tall mason jar. All you need is some dry milk powder, cocoa powder, and powdered sugar to create the perfect mug of steamy hot chocolate. It makes such a creamy, rich, chocolate flavor that is just amazing! And of course, no holiday hot chocolate would be complete without the addition of marshmallows, crushed candy canes, and mini chocolate chips too! Those help fill the space in the rest of the jar and keep all the layers of ingredients in place. It makes the jar look so pretty too! I printed a cute recipe card tag to tie around the jar, and added white doily on top of the lid. 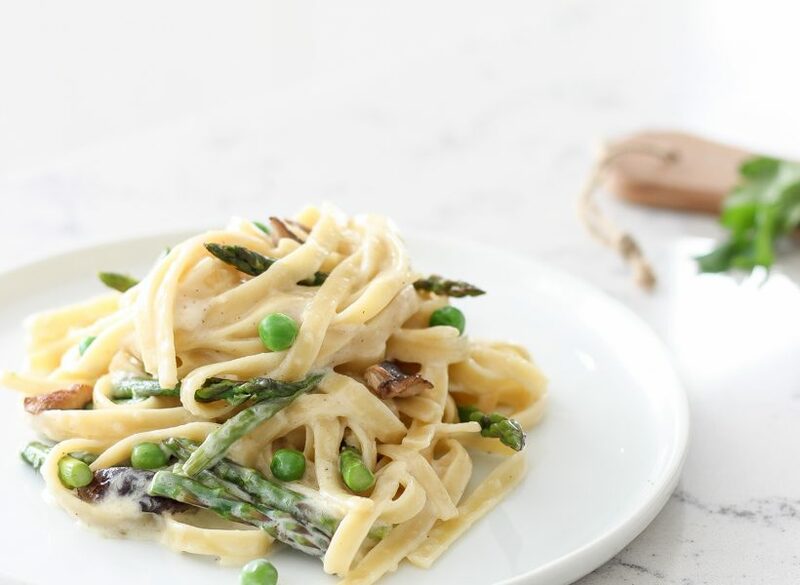 Your friends and family will definitely want to make this recipe at home again for themselves! Click here to print the recipe card tag. * EDITED (11/12/15): By popular request, I have updated this homemade hot chocolate with a NEW recipe and TWO NEW recipe tags! Click here to find the updated recipe! As much as I try to think of unique gifts for everyone on my list, sometimes gift cards are still the best option. But what fun is it to just hand someone a tiny little envelope? 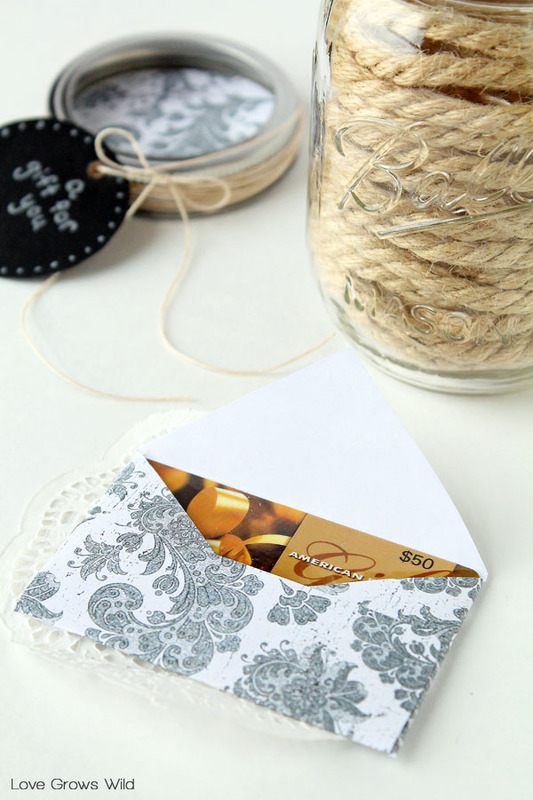 Why not put the card in a gorgeous decorated mason jar for them to open? I love that you can personalize this idea for whoever you’re buying for! 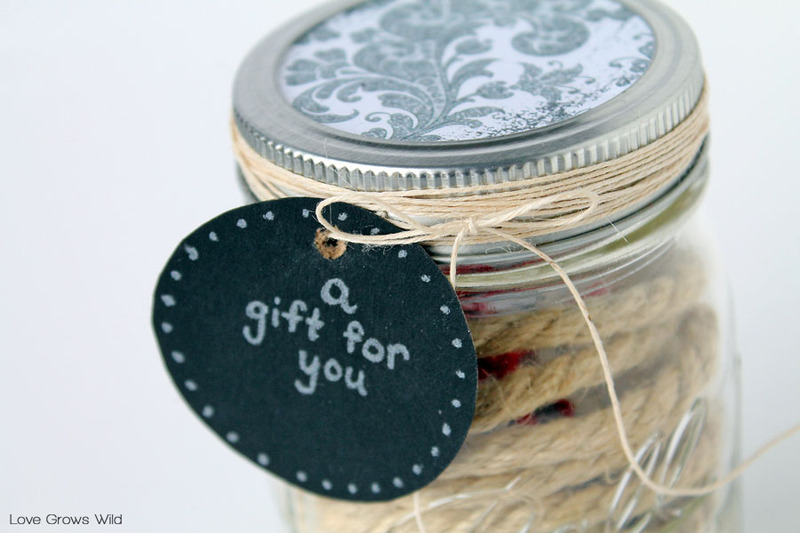 This one reflects my personal style, with a chalkboard gift tag and rope wrapped around inside the jar to conceal the gift card. Seriously, can I just keep this one for me?? You could use anything inside the jar… fabric scraps, candy, beads, or whatever you have on hand! Get as creative as you’d like! And I promise the receiver of this gift will be way more impressed than just a plain, boring envelope! This one is double-duty: give it as a creative decor gift or keep it to decorate your home for winter! I can never have enough candles in my home during winter. It just makes everything feel so cozy and warm. I’m always re-purposing mason jars as candle holders, but adding this faux snow to the bottom made them extra special and festive! Want to know what it is? Salt! I dabbed a bit of regular old white school glue onto the bottom of the jar and sporadically up the sides a bit and rolled the jar in kosher salt until all the glue was coated. I let it dry about 24 hours and wrapped some thick wire around the top to create a lantern. 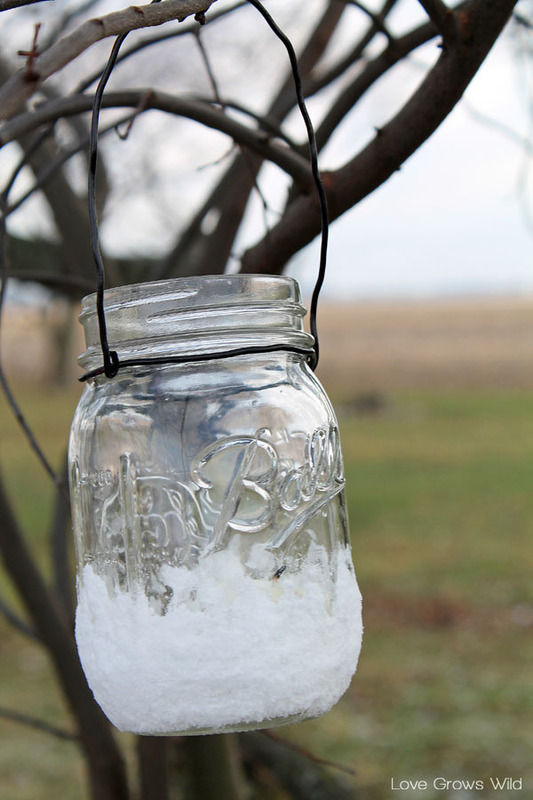 A flickering white candle inside makes the mason jar glow beautifully through the “snow”! And that’s it! For more unique gift in a jar ideas and holiday inspiration, check out the Ball Canning Pinterest page where you can enter to win a different prize everyday for 25 days! The grand prize winner will receive a FreshTECH Automatic Home Canning System!! How fun is that? For more details and official rules, click here. Which gift in a jar idea was your favorite? Thank you to Ball Canning for sponsoring this fun post! I received Ball products to use, but of course all ideas and opinions are 100% my own! PREVIOUS: Under The Mistletoe Wall Art & Silhouette Black Friday Sale! I really like the gift card idea. I haven’t seen that one before. Of course the candy or hot chocolate for me would be a great gift. Me too, Emily! I know that gift cards are such a practical gift, but they’re not very much fun to give someone. This adds a special touch! The hot chocolate mix doesn’t seem to practical or simple, it may look cute but really when you actually make the hot chocolate it would get so messy and I don’t even understand how I’m supposed to get everything separated. You don’t separate the layers. It is layered and presented in the jar for a festive, gift giving look. When you are ready to use it, simply mix all the layers together. To make it even easier, pour the contents into a plastic zipper bag and shake it up. Measure out the 1/2 cup of mix and add boiling hot water. Stir until dissolved. It’s a wonderful idea. Practical? It’s a whimsical gift in a jar. If I received the hot chocolate as a gift, I’d know exactly what to do … drink it. 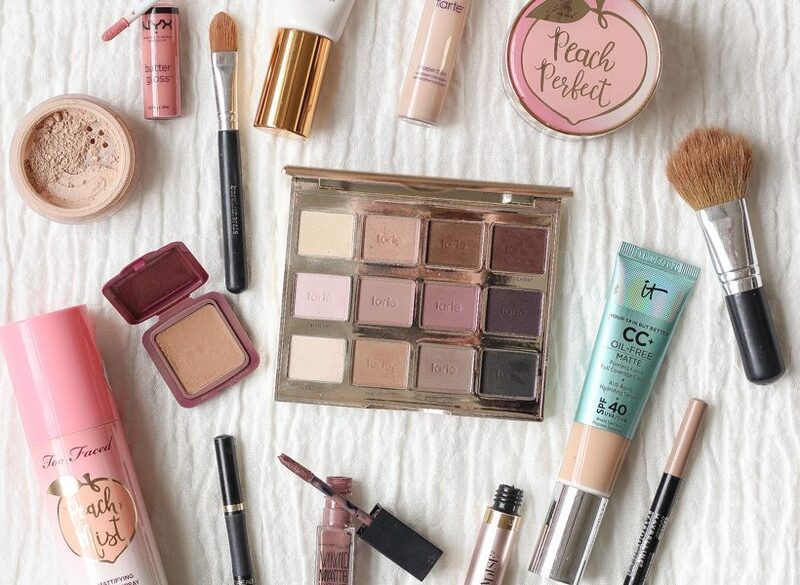 Messy is the best part! That’s exactly what I would do as well! It may be a little messy but it is a cute and fun idea for people that is relatively inexpensive. If I received this I’d throw it all together, follow the directions and make it! The best part is drinking it on a cold night and making some mess along the way. Hi Paula! The mint scrub is AWESOME! I’ve been using it a ton as this nasty cold weather sets in. It smells incredible too! Thanks so much for stopping by! 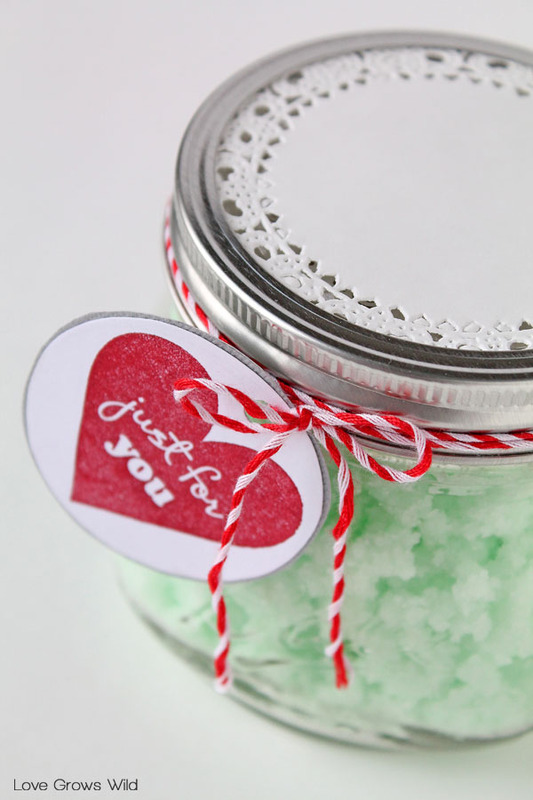 What is the recipe for the mint sugar scrub? I could not find it on here. Love these ideas! I bought a case of mason jars and now I know exactly what to do with them! Love your hot chocolate recipe. Do you happen to have a download of the adorable tag you made for it? Liz – could I also get that adorable tag? Making them for all my neighbors this Christmas. Absolutely! 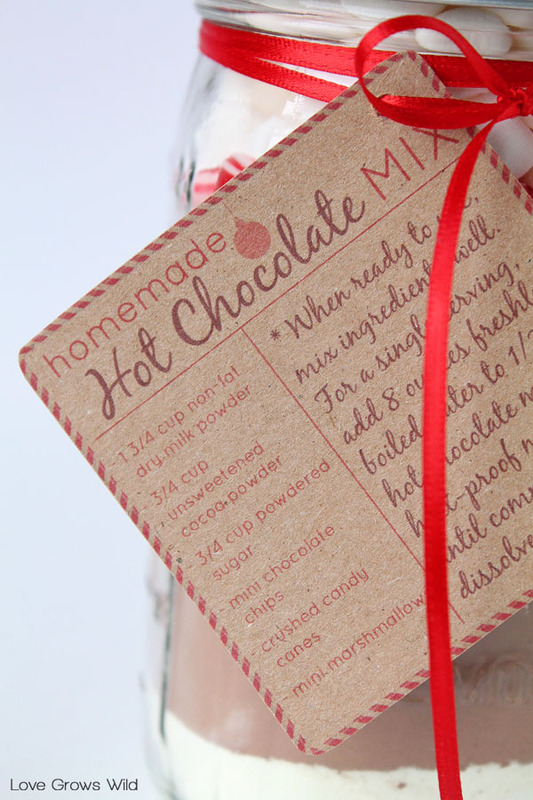 I added a link right above the hot chocolate mix recipe for the printable gift tag that goes along with it. I’m sure this will make your neighbors very happy! Thanks so much for stopping by! I love all of these ideas, they’re wonderful! Where can I find the recipe card that goes along with the Hot Chocolate? How did you make that? I love it. Thanks, Liz! Hi Lysa! There should be a recipe box with the ingredients and instructions within the post. Were you not able to see it? I love all of these ideas. Can you please tell me how you made the tag for the Hot Chocolate? I love all of your ideas! Can’t wait to make the mint sugar scrub tonight and the cocoa mix. Would you mind sending me a copy of your gift tag as well? It is so cute! I loved the hot chocolate tag, please email me the link. This is perfect with having dry milk in pantry to be used. 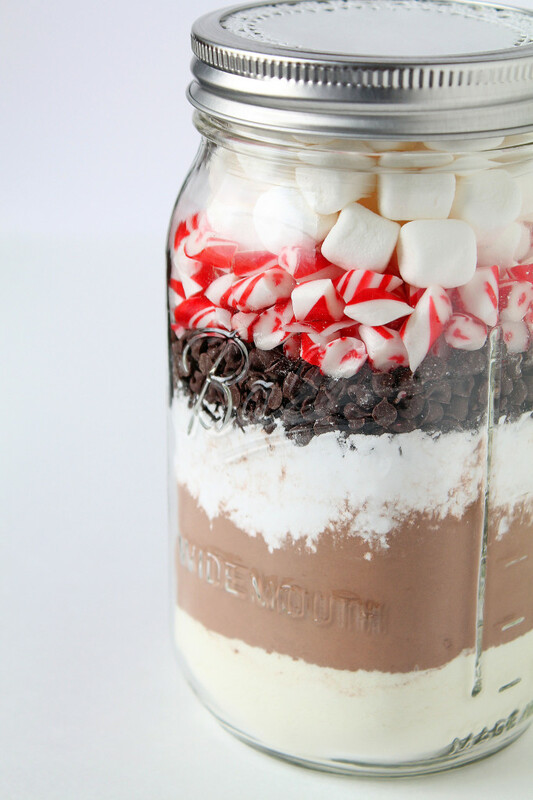 OMG, love love love your hot chocolate jars . Gonna maKe them at my family’s annual bake day. Any way you can send me a download of your tag? What did you print it on to? Very Creative! Stopping by from the Sparkle Link Party….love the hot chocolate jars with marshmallows and candy canes! So clever! 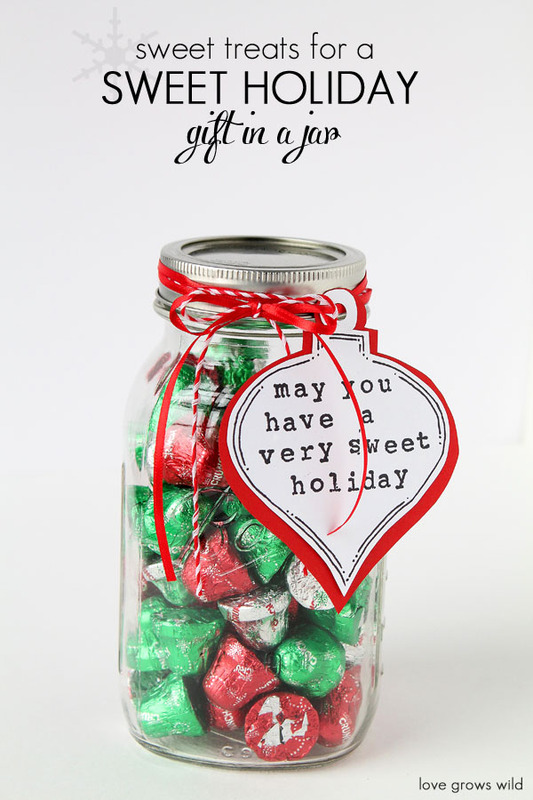 Everything looks amazing in a mason jar, but I love those printable gift tags you made! I think my favorite has to be the minty sugar scrub though…..looks so yummy and refreshing! You’re too sweet, Kalyn! Thank you so much! I agree, that mint sugar scrub is pretty awesome, and I love how soft it makes my skin feel. And the scent is very invigorating! I hope you have a very happy holiday! Mason jars have so many fun uses! I love the hot chocolate idea – the layers are gorgeous! I agree, Kristen! Those layers make for such a pretty gift! Gotta love good ol’ mason jars! I’m going to make 20 of these for client gifts. How many mason jars does each recipe fill? Is it just one? Thanks and can’t wait to make! Hi Kristen! I think your clients will love these! Are you asking about the hot chocolate mix? If so, the recipe will fill one 32 ounce mason jar. I hope this helps! Thanks so much for stopping by! How adorable!! I love the gift card holder jar!! 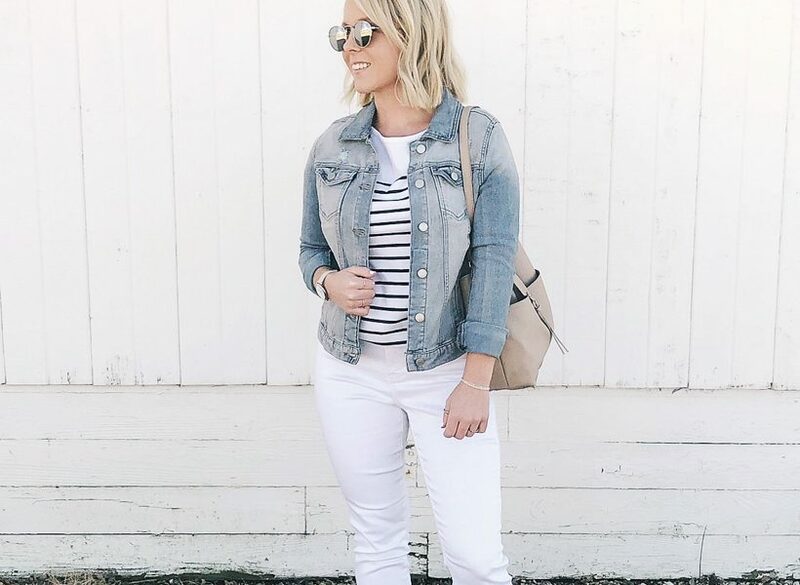 Super cute and so easy!! Thanks so much for sharing!! Thank you so much, Lisa! I love finding fun ways to give gift cards because it’s no fun just handing someone a tiny little envelope! A pretty mason jar is way more fun 🙂 So glad you could stop by! Happy holidays! Go buy yourself some for Christmas! I use them all the time for all kinds of different things. They’re super handy to have around! Thanks so much for stopping by today! Lisa, thanks so much for these great ideas. I have a question about the hot chocolate mix – the recipe calls for 1 and 3/4 cups of dried milk powder, but when I put that into the 32 oz jars, it comes almost half way up the jar. In your photos, it looks like almost equal parts dried milk, cocoa and powdered sugar. Is 1 and 3/4 cups the correct amount on the milk? If not, is there a way to correct the adorable recipe card to the right amount? Ooops! I meant LIZ! I don’t know where I got Lisa…. No worries, Kaille! I was very glad you said something! Some days my brain just hits overload, especially during the holidays, so I appreciate you letting me know! And I agree, those ingredients do look super cute all layered in a jar! That was so sweet of you to make these for your friends, and I’m sure they will love their gift! I wish you a very Merry Christmas, and thanks again for stopping by! I wish I had known that before I made 4 jars of it.. do you think it will be awful with so much milk powder? Hi Laura, I’m so sorry for that! There’s still quite a bit of chocolate in the recipe, especially if you added any chocolate chips, so I would think it would just be an extra creamy hot chocolate. Many recipes I’ve found for hot chocolate mix have quite a bit more of the milk powder than the rest of the ingredients, but I just prefer mine to be a bit more chocolatey 🙂 So I can’t say 100% for certain, but I do believe it will be just fine! You really can’t go wrong with chocolate, powdered sugar, candy canes, and marshmallows! I apologize again for the previous error! No need to apologise! Thanks for the great idea. They’re super cute. It gave me an excuse to try out the mixture and it was delicious, and I didn’t have to add extra milk. So no problem! Thanks! That’s wonderful! I’m so glad it all worked out, Laura! Thanks so much, and enjoy your hot chocolate! Happy Holidays! Hi Brittany! Yes, I think you’d definitely be able to cut this recipe in half! Just decrease the powdered milk, cocoa powder, and powdered sugar to fit in the size jars you have and add the chocolate chips, marshmallows, and candy canes with whatever room you have left. They’re just yummy toppings for the hot chocolate, so fit what you can! I hope this helps! Let me know how it works for you. Happy holidays! Liz, how do you make the wire hangers for the jars? How heavy of wire do you use? I think they are so cute and useful too! Thanks! Hi Connie! I’m not sure the exact weight of the wire (it was in the “leftover” stash), but I first wrapped one piece around the top of the jar underneath the lip and twisted the ends together until they were nice and secure. Then I took a longer piece of wire, curled both ends up, and hooked them on the wire wrapped around the top of the jar to create a hanger. You’ll want to wait to fully tighten the wire around the jar until you have the hanger hooked into place. Then you should be ready to hang your new lanterns! Hope this helps, and thanks for stopping by! 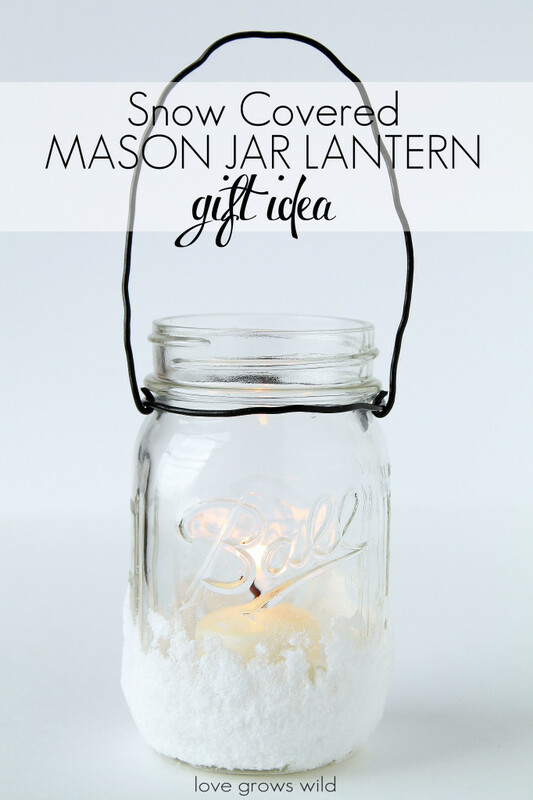 I love your hot chocolate mason jar — it looks great and is a great holiday gift idea. One question about the jars with chocolate — do you know how much of a 12 oz bag of chocolate fills a quart-sized mason jar? (Or if you used pint-sized, how much of a 12 oz bag fills it?) I need to put 36 jars together (in a budget, of course) and I’m trying to determine how many bags of candy I need to fill them. I’d do wrapped chocolates (mini-snickers, kisses, etc.) so they take a bit more space. Any help you can offer would be much appreciated. Thanks! Hi Rupa! I used a quart size jar, and if I remember correctly, a bag of the fun size chocolates definitely filled one jar and probably could have filled two if you don’t need them 100% full. Since you’re going to make so many jars, it might be a good idea to grab a bag of candy and a jar to test out how much you’ll need! The pint size jars may work better for the amount you’re doing. Sorry I couldn’t be more help, but I bet people are going to love these little gifts! The link to download the tags you made is not working. can you assist? I love the tag! Hey Michele! I’m so sorry you’re having problems with that! 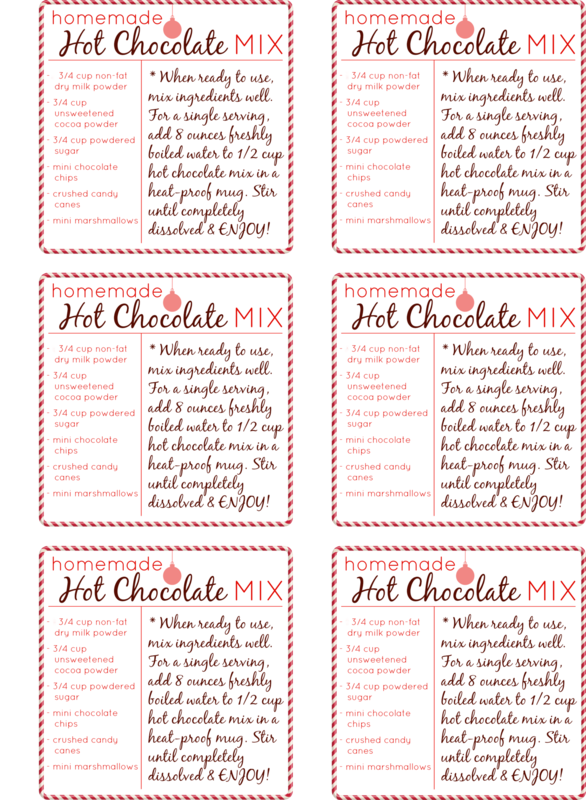 Are you using this link: https://www.dropbox.com/s/mxr3u7ichlj8gxp/Homemade-Hot-Chocolate-Gift-Tag-Set.png.pdf? I wanted to make these for my friends for Christmas. They are so cute. I do have a question about the layers of things that are in the mason jars. amount of goodies in there cup of cocoa? I’m trying to figure this out!!! I am dying to ask how you made the wire holder for the snow/salt candle jar. I tried using an old coat hanger but the memory/hardness of the wire keeps springing back after I wrap it around the jar and it just won’t stay tight to it. Would you give me the recipe for the bath scrub, etc. along with the tags please? Hi Liz, I’m trying to download the tags for the hot chocolate, it’s bringing me to this Dropbox website telling me that I’m in the wrong place or to sign in? Is there something that I am doing wrong? Ahhhhhh please help. Hi Liz, I just wanted to say the the hot cocoa idea was genius. I just wanted to know what kind of paper you used for the recipe cards because I just thought they were amazing. Hey Tracy! I’m so glad you like it! I just used kraft cardstock (sort of a natural brown color) from the craft store to make the tags. I hope this helps! Your awesome hot chocolate recipe requires nonfat milk powder. Is that instant or non-instant milk powder? Thanks for sharing! Hi! 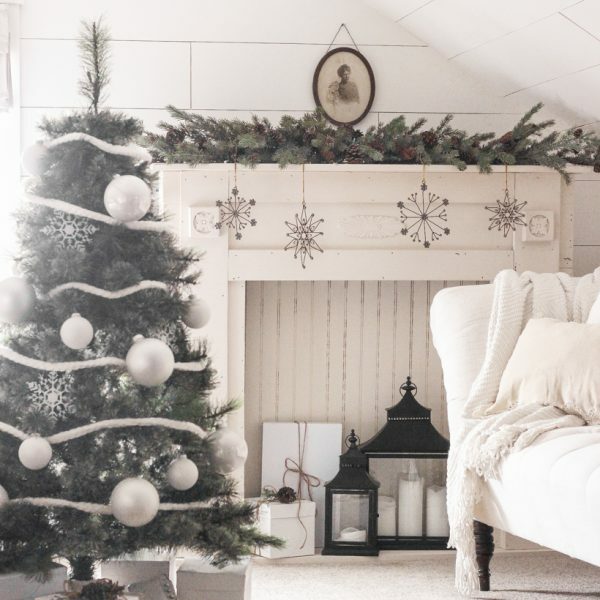 This is an amazing entry, perfect for the holidays! 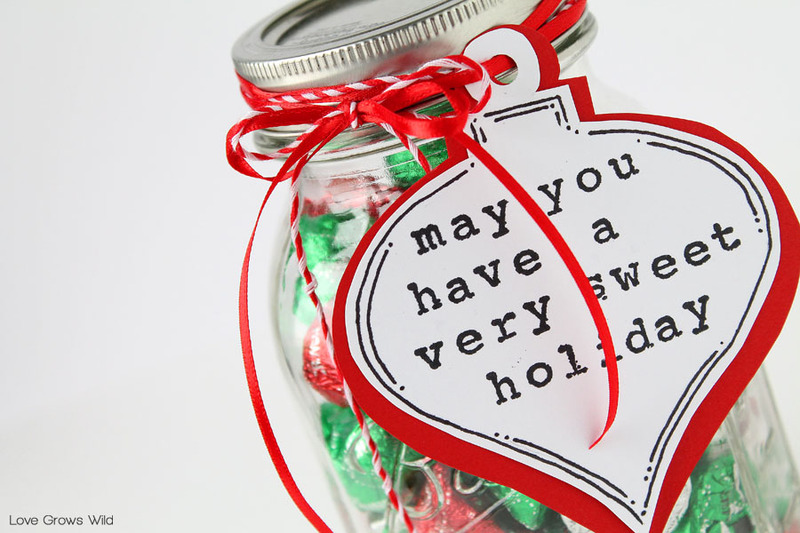 Would it be alright if I ask for a copy of the template you used for the first jar’s card (“may you have a very sweet holiday”)? 🙂 Thanks! Thank you so much, Jean! I would love to share a template with you, but I honestly did those by hand for this project. I drew an ornament shape on a piece of paper and used letter stamps for the words. I wish I had them to share, but I promise it’s really simple to design some yourself! Your hot chocolate jars are so festive! Thank you for the free recipe printable! Would you mind sharing what brand of milk powder you used in the recipe? This would be so fun to do with a Girl Scout troop! Unfortunately I don’t still have the tags set up where I can edit them, so I’m not much help there. I bet the girls can get creative and come up with something! Best of luck! 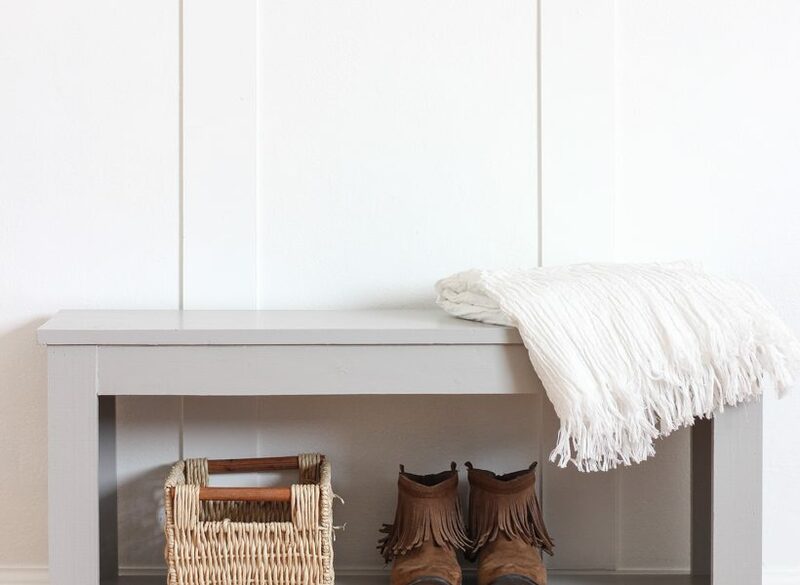 Just found your site through Pinterest! 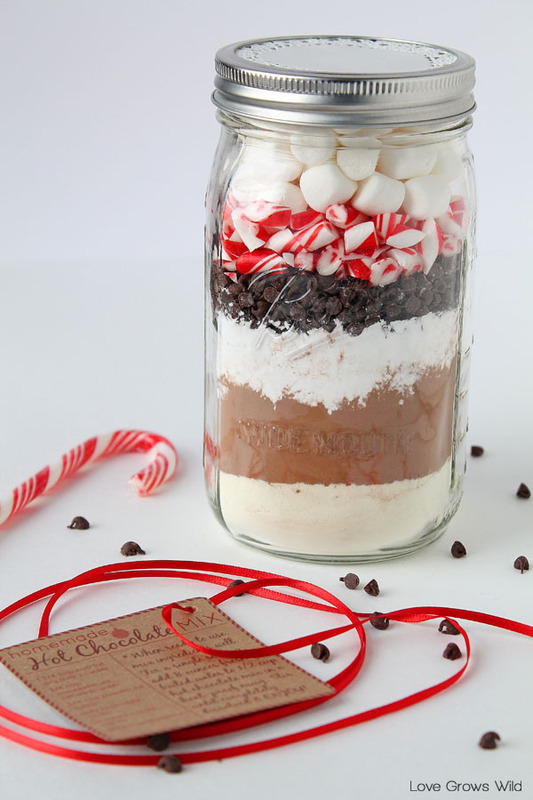 Love your Mason Jar ideas especially the Hot Chocolate and would like to make them this Christmas for family. I was wondering if there is a way to get the tag template? I loved the idea of the hot cocoa mix in jars for economical and cute Christmas gifts, so I went out and bought all of the needed supplied, and after making all of the jars, I tried to cocoa…. it was terrible! It was bitter and way to Cocoa-y. Now I don’t want to give all of these jars as gifts and am out $50! Test the cocoa and see of you like it BEFORE making! I’m so sorry to hear that, Remi. I like a good, strong hot chocolate, but that’s a great tip to try the recipe first. Thank you for the feedback! I found your website through Pinterest! Thank you very much for sharing recipe especially hot chocolate!! Perfect Holiday Gift! Just have one question on the ingredients. I have 16oz mason jars. So, what measurements would you recommend. Thanks again! I am glad that I found this wonderful website! Brilliant Ideas. The manson jars that you used are 32oz. I only have 8oz jars, half pint manson jar. May I know what will be the ratio for hot cocoa mix? Thanks! Hi just a quick question, There’s 18 days left until christmas do you think i should wait to make my jars until a day or two before christmas or do you think they would be good still if i made them now and sealed them up until christmas eve and christmas day…?? Thanks so much Ill be putting them together tonight!! 🙂 And btw I put one together just so I could mix it all up and taste it and I thought it was awesome! Yay!! I’m so happy to hear that, Staci! 🙂 Have fun giving them for the holidays! I just tested a jar from a week ago, and although the jar was properly sealed, the marshmellows had gone stale 🙁 any tips on how to keep them fresh? I plan on using your idea for the hot cocoa (seems to be very popular) as cute gifts. I tried downloading the recipe tags, but the site is unavailable. Do you mind posting the link in a reply? Thank you! Thanks for sharing these great ideas! I love love the Hot Chocolate one and am making some for my coworkers for Christmas. I am using smaller jars, so will end up changing the recipe a little bit. I see the tags you shared (which are so adorable, btw) are in PDF format, so I can’t change the ingredients on there. Is there any way you could share a version of it that is editable? Or perhaps I can give you the amounts I’m using and you could help make a new tag? I hope this isn’t too much to ask; I just have no idea how to make my own. Thank you in advance~!! Hi Liz! How sweet of you to make these for your co-workers! I think they’re going to love ’em! Unfortunately I don’t have a document that you can edit, so I won’t be able to help you there. You could always make a little tag yourself in Microsoft Word or Picmonkey.com… Picmonkey usually has some really cute holiday graphics and fonts that you can use! 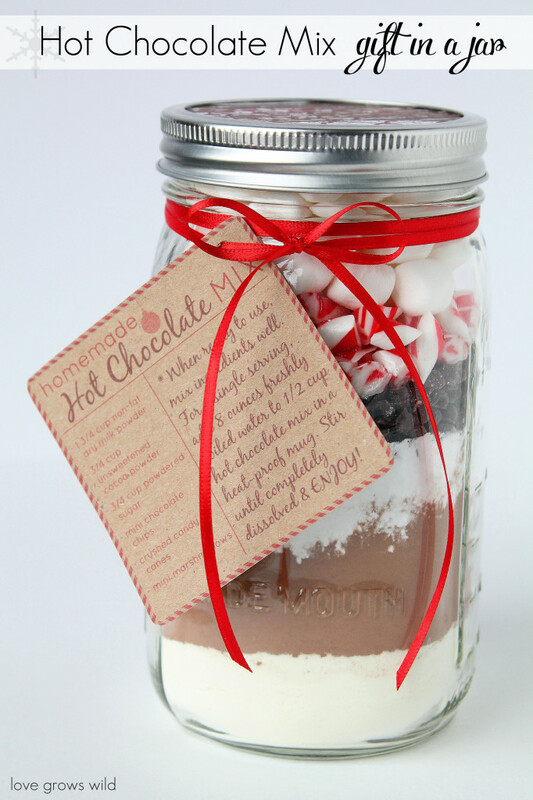 I love your hot chocolate mason jar idea for gifts! I am making some this weekend but I cannot find any mini chocolate chips. Would the normal sized chocolate chips still dissolve okay in the boiling hot water? Please help me!! I just bought all of the stuff to make the hot chocolate in a jar. I’m super confused. I did a test batch because I always like to try things before I give them as gifts. I followed your recipe exactly and after mixing it all together I added 1/2 cup to 8 oz of hot water. This was far from creamy or good. I could barely swallow it. It was so bitter and thin. Any suggestions? I fear I just wasted $50 on jars and ingredients. What am I doing wrong? Hey Annie! I’m here to help! I’d recommend trying just 1/4 cup in 8 ounces of water and see how you like it. I just made a cup for myself, and I think that ratio is good for people who like a nice, sweet hot cocoa. Let me know how that works for you! I had the same exact issue as you and ended up tweaking the recipe. Cutting back on the coco and adding the same amount of non-dairy creamer as dried milk helps quite a bit! Great tips! Thanks for sharing your feedback, Remi! Hi Liz, I love your hot chocolate jar recipe idea. i am having trouble with the link for the tags. Can you try to repost it again so I can print it?? Thank you so much> you have made my christmas so much easier!!! Hello. Do you think I can replace the dry milk powder with non-dairy creamer? Would the ratio of 3/4 cup change? What is the difference between the two? Hi Maria! I haven’t tried that substitution, so I’m not sure. READERS: Have you tried this? I’ve actually found that the non-dairy creamer works just as well if not better! I added some to my mixes and it really helped to make them more creamy. Ok, so I’m a crafting dummy, but I’m going to attempt to make a variety of jars (the cocoa, the sugar scrub and the candy jar). Thank you for including the downloadable gift tag for the cocoa, but how do you suggest making the other cute tags? Did you print them yourself? Stamp them? Buy them? They’re just darling! Any advice you can offer would be appreciated! I’m so happy to hear that, Larissa! Glad I could make your holidays just a tiny bit easier. 🙂 Merry Christmas! Hi. Liz made a jar of hot cocoa as a gift and realized that the recipe calls for 3/4 cup of non fat dry milk but the gift tag you have printed says 1 and 3/4 cup. Which is correct??? I just made 55 of the hot chocolate mixes. They turned out perfect and were easy to make. I read the comments and got some great tips to keep the layers looking perfect in the jars. We had mason jars left from a previous event. I was trying to think of a way to use them. I came across this and decided to make them for my co-workers. We had another project scheduled for my husbands co-workers. However, when he saw mine he wanted these instead. I also made a few for a friend who saw them. Thank you for the great post! PS..A couple of them I changed up and added a black doily on top, glued on three button and wrapped a piece of fleece on the neck to make it look like a snowman. Recipe was still the same. Tried a few with pint size jars. Changed the ingredient to 1/2 cup instead of 3/4 cup and it worked fine. Even taste tested it. 🙂 Only thing, the cute tag ingredients were incorrect. I really liked the tag so I went back to the quart jars. Wow! You’ve been a busy little elf, Melissa! 😉 I’m so glad these worked out as a great gift idea for the holidays. Thank you for sharing your feedback with us! Merry Christmas! I REALLY LIKE THESE GIFTS IN A MASON JAR. COULD YOU USE ANY EXTRACT FLAVOR IN THE SUGAR SCRUB? Super cute thanks for all the cool posts! I just discovered and signed up for your site and am so excited!!!!!! These are awesome ideas. 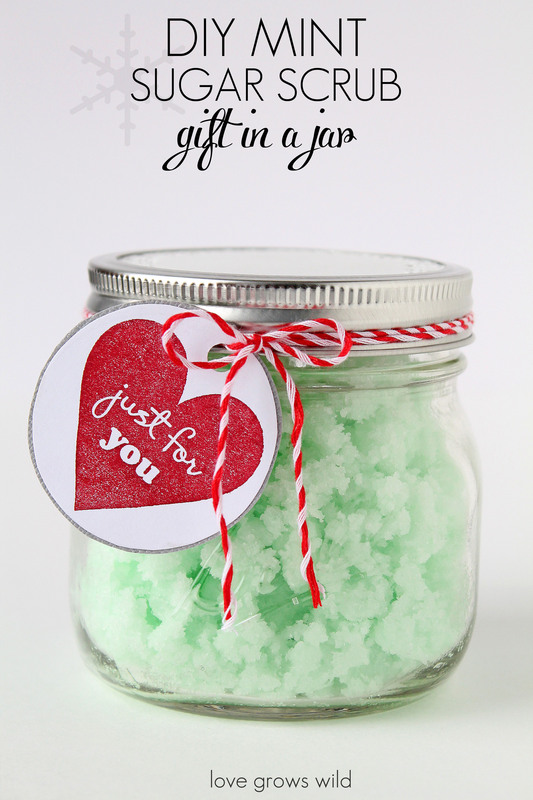 I like the snow covered candle jars and want to make a couple and will get the supplies today to make the mint scrubs as was trying to decide on about 15 little gifts for the gals in our doctors offices and this is great! May make some of them in the others also! So looking forward to all of your ideas and recipes. Off to make the pumpkin smoothie….yum!!! Thanks so much!!!!!!! Just a quick query on the hot chocolate recipe — the card in the photo says “1 3/4 cup non-fat dry milk powder”, but the printable card says “3/4 cup non-fat dry milk powder”. Where is the recipe for the mint sugar scrub? I would love to try it! I have made the hot chocolate ones for gifts this year! Tastes (I tried) and looks great!